BORN: 28 April, 1948, in Beaconsfield, Buckinghamshire. Died: 12 March, 2015, in Broad Chalke, Wiltshire aged 66. Sir Terry Pratchett will be remembered as one of the most beloved and successful fantasy authors ever, whose books – particularly the Discworld series of more than 40 novels – sold more than 85 million copies worldwide. A prodigiously speedy writer, he released two books a year at his peak, which undoubtedly helped contribute to the fact he was the biggest-selling UK author of the 1990s. Such a time-specific accolade, however, masks the fact that his commercial success endured right up to his death. In later life, after he announced in 2007 that he was suffering from early-onset Alzheimer’s, Pratchett became an outspoken advocate for those suffering from the disease, presenting two BBC documentaries related to the subject – one detailing his own experiences with Alzheimer’s and another examining the law on assisted dying. He was awarded an OBE in 1998, a Knighthood for services to literature in 2009 and the World Fantasy Award for Lifetime Achievement in 2010. Born Terence David John Pratchett in Beaconsfield, Buckinghamshire, the only child of David and Eileen, Pratchett grew up partly in Bridgwater, Somerset and then went to High Wycombe Technical High School rather than the local grammar school (his reasoning being that “woodwork would be more fun than Latin”), although he attributed the best part of his education to personal reading in the local library. As a boy his interests included astronomy, reading science fiction and attending conventions. His first short story, The Hades Business, was published in the school magazine when he was 13 (two years later it would be printed professionally). Pratchett earned five O-levels at school, but left during his A-levels at the age of 17 to pursue his preferred career in journalism. Taking a job at the local Bucks Free Press he wrote stories for the paper, as well as earning his English A-level and some professional qualifications. He was a constant prose writer outside of work, and his break came when he interviewed a small publishing company manager named Peter Bander van Duren for the paper in 1968, mentioning during their chat that he had a manuscript of his own named The Carpet People. Three years later, with van Duren having read the manuscript, liked it and given it to his partner Colin Smythe of Colin Smythe Ltd Publishers, the latter published the book – about a tribe travelling across a flat world known as “the Carpet” – as Pratchett’s first printed novel. Although he later revisited and rewrote the book in 1992, it was well enough received that two follow-ups followed through Colin Smythe Ltd. The Dark Side of the Sun (1976), a tale of boundless invention concerning strange alien races living in close proximity to one another, and Strata (1981), another story set on a flat world, were Pratchett’s only two pure science fiction novels. The trope of the flat world used in The Carpet People and Strata returned once more with Pratchett’s next book in 1983. 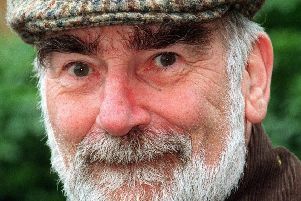 He had maintained a career in journalism and latterly took on a post as press officer with the Central Electricity Generating Board with responsibility for some nuclear power stations (not long after the Three Mile Island incident, a source of dry amusement to Pratchett) and the publication of The Colour of Magic in 1983 was the beginning of his life as a successful fantasy author. The first in the Discworld series, it was described by its author as an attempt to do for the fantasy genre what Mel Brooks’ film Blazing Saddles had done for the Western. Detailing the journey of wizard Rincewind, guide to wealthy tourist Twoflower, to the city of Ankh-Morpork while unwittingly being guided by game-playing gods, The Colour of Magic set the tone which defined Pratchett’s future work for his readers. At the heart of the story was a tumultuous, wide-eyed sense of invention in world-building and character population, while the humour came from a dry and flippant cynicism directed with no small amount of disguised affection at both the fantasy genre and real world situations. The Light Fantastic followed in 1986 and both Equal Rites and Mort came in 1987, establishing the busy pattern that Pratchett continued with over the next two decades, as long as his health allowed. The latter of these first four Discworld books still stands as a classic among Pratchett fans as the first which featured the strangely ripe-for-comedy character of Death in the lead role. It was also Pratchett’s final book with a day job, his rapidly increasing success allowing him to become a full-time writer following its completion. He went on to quickly establish himself as a titan of the fantasy fiction market and as a minor media celebrity thanks to the crossover appeal of his novels and a distinctive image which involved the wearing of a black fedora hat and cowboy-style jacket. Alongside the ever-expanding collection of Discworld books, his publications included 1989’s book of cat anecdotes The Unadulterated Cat, Good Omens with Neil Gaiman (then a comic writer, later a well-established fantasy and film writer himself) in 1990 and a range of children’s novels including the Nome trilogy (1988 to 1990) and the Johnny Maxwell trilogy (1992 to 1996). For one who wrote so avidly, Pratchett also seemed to find time for many distinctive hobbies. He was a supporter of the British Humanist Association and the National Secular Society, a keen walker and an amateur astronomer who had a small observatory built in his own garden. Having an interest in heraldry, he designed himself a coat of arms and helped smelt himself a sword made of iron ore in 2010, both after he was made a Knight. Initially believing he had suffered a stroke a couple of years previous, Pratchett discovered in 2007 that he had a rare form of Alzheimer’s disease named posterior cortical atrophy (PCA), which he would famously describe as an “embuggerance”. Determined to “keep things cheerful”, he continued to work, although the condition made it difficult to sign lengthy dedications on books and later to type without the help of an assistant. While he was still able to he publicly discussed his condition, lobbying for increased dementia research funding and a change in the assisted dying laws, while the 14 books and anthologies published after his diagnosis included the young adult novels Nation and Dodger, as well as five more Discworld books: the final one, The Shepherd’s Crown, is due later this year. Terry Pratchett died at home with his family around him and “his cat sleeping on his bed”, according to a statement from his publishers Transworld.